The Website and the data contained within it are supplied solely for informational use. Apart from any fair dealing for the purpose of private study, research, criticism or review, as permitted under the Copyright Act 1968 (Cth), no part may be reproduced or re-used for any purpose whatsoever without the written permission of webfind.com.au. However, users of the Website may download individual listings for their own private use in the course of the normal use of the Website for directory assistance purposes. The Website and the publication contained within it are the copyright © of Niwi Pty. Ltd.
webfind.com.au currently provides Clients only with access to a wide variety of on-line resources, including the ability to modify viewable information, various CRM tools and order point facilities, through its network of Listings (“Listing”). Unless explicitly stated otherwise, any new features that are added to improve or enhance the current Listing, including the release of new webfind.com.au listings, shall be subject to these TAC. You understand and agree that the Listing is provided “AS-IS” and that webfind.com.au assumes no responsibility for the timeliness, deletion, mis-delivery or failure to store any user communications or personalisation settings. The Listings, Clients, or third parties may provide links to Websites Operated By Other Parties (“TPW”) or resources. webfind.com.au has no control over such sites and resources, and does not have a practice of monitoring or making inquiries about the content of such sites accessed by such links. You acknowledge and agree that webfind.com.au is not responsible for, does not endorse and makes no representations either expressly or impliedly concerning TPW, their content or any products or services that they offer. Any content contained on TPW does not represent the views of webfind.com.au. You access TPW completely at your own risk. The Website contains content provided to webfind.com.au by other parties (“TPC”). webfind.com.au does not have a practice of monitoring or making inquiries about TPC. You agree that you must evaluate and bear all risks associated with the use of any Content, including any reliance on the accuracy, completeness, or usefulness of such Content. In this regard, you also acknowledge that you may not rely on any Content created by webfind.com.au or submitted to webfind.com.au by webfind.com.au Clients. Except where any law implies any term into your use of or any arrangement arising out of the accessing of the Website and that law prohibits exclusion of that term, webfind.com.au is not responsible for, do not endorse and make no representations either expressly or implied concerning TPC. You rely on TPC completely at your own risk. If webfind.com.au believes that information provided is not true, current and accurate, webfind.com.au has the right to suspend or terminate your subscription to the Listing and refuse any and all current or future use of the Listing. You understand that all information, data, text, software, music, sound, photographs, graphics, video, messages or other materials (“Content”), whether publicly posted or privately transmitted, are the sole responsibility of the person from which such Content originated. This means that you as the Client, and not webfind.com.au, are entirely responsible for all Content that you upload, post, e-mail or otherwise transmit via the Listing. webfind.com.au does not control the Content that is posted on the Website through the Listings, as such, cannot and does not guarantee the accuracy, integrity or quality of such Content. You understand that by using the Website, you may be exposed to Content that is offensive, indecent or objectionable. Under no circumstances will webfind.com.au be liable in any way for any Content, including, but not limited to, any errors or omissions in any Content, or any loss or damage of any kind incurred as a result of the use of any Content posted, e-mailed or otherwise transmitted via the Listings. – intentionally or unintentionally violate any applicable local, state, national or international law, and any regulations having the force of law. You acknowledge that webfind.com.au does not have a practice of monitoring content associated with Listings, but that webfind.com.au and its agents and designers shall have the right (but not the obligation) in their sole discretion to refuse or remove any Content that violates the TAC or is otherwise objectionable, that is available via the Listings. You acknowledge and agree that webfind.com.au may preserve Content and may also disclose Content if required to do so by law or in the good faith in the belief that such preservation or disclosure is reasonably necessary to: (a) comply with any legal process; (b) enforce the TAC; (c) respond to claims that any Content violates the rights of third-parties; or (d) protect the rights, property, or personal safety of webfind.com.au, its users and the public. You understand that the technical processing and transmission of the Listing, including your Content, may involve: (a) transmissions over various networks; and (b) changes to conform and adapt to technical requirements of connecting networks or devices. You acknowledge and accept that, as a condition of registering for a Website listing, webfind.com.au reserves the right to freely advertise to and otherwise make available promotional material to all registered site users. Such materials are subject to change and alteration. Where any statute implies any term into your use of or any arrangement arising out of the accessing of the Website and that statute prohibits exclusion of that term, then that term is included. If and to the extent permitted by the statute, however, webfind.com.au and their contractors’ liability for any breach of such term is limited to the correction of error and the resupply of services. 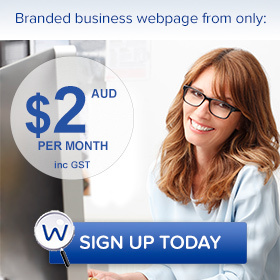 webfind.com.au is registered for the GST. It is acknowledged by the Client that any costs of use of the Website by the Client will incur GST. webfind.com.au will deliver to the Client a Tax Invoice for each supply in the form that complies with the GST Act and the regulations under the GST Act. The governing law for this Agreement and the TAC herein are the laws of the State of New South Wales and the Commonwealth of Australia. To the extent that any inconsistency exists between the State laws and the Commonwealth laws it is acknowledged that the Commonwealth laws shall prevail. It is a condition of use that the Client maintain the appropriate software, hardware and any other technological requirement at their own expense. It is also agreed that webfind.com.au is in no way responsible for the upkeep or provision of any software, patch or any other technological requirement (including hardware) to enable the Client to browse, review, update or otherwise use the Website. Payment is for the month or year in advance of the service. Refunds will be granted on a case by case basis and pro-rated to the date of listing expiry.